There are many types of thank-you letters out there. Today, we are going to focus on meeting thank-you letters. This type of thank-you letters is written with an aim to thank a person or a couple of people who had a meeting with you recently. 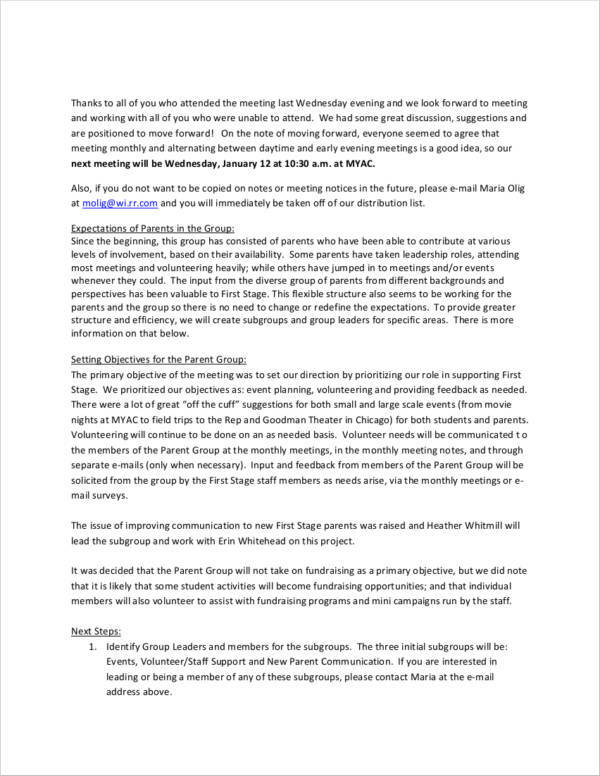 This letter focuses mainly on the meeting such as the points that were discussed during that meeting and what will be implemented in the future. This also appreciates the inputs that were given by the recipient that can help to conceptualize what is written on the meeting agenda. Appreciating the efforts of the other person or the people who attended the meeting is going to give them a boost of confidence and will make them feel that their attendance was important. If you need a quick guide to writing meeting thank-you letters, we are here to give you a couple of tips that can help you come up with your very own. 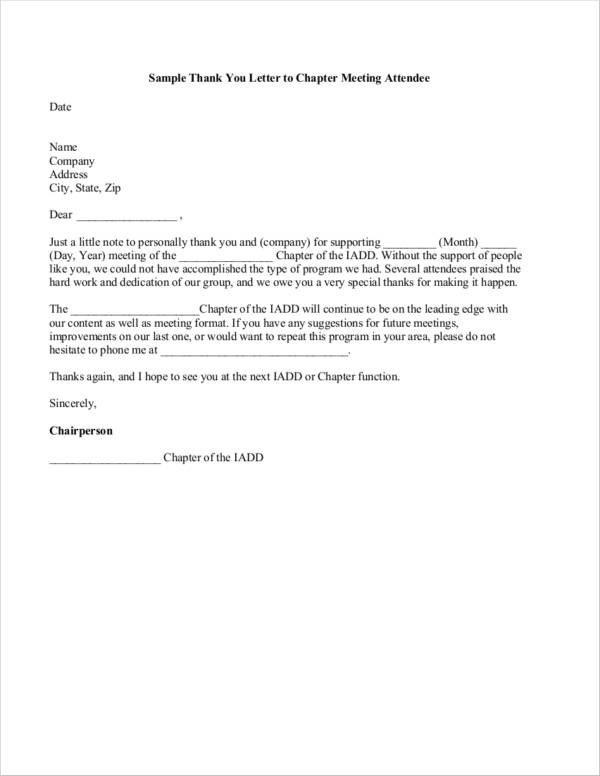 We have also uploaded a couple of sample thank-you notes for meeting that you can use as a reference for making your very own meeting thank-you letter. Check it all out down below. What Should Be the Structure of Your Thank-You Letter? 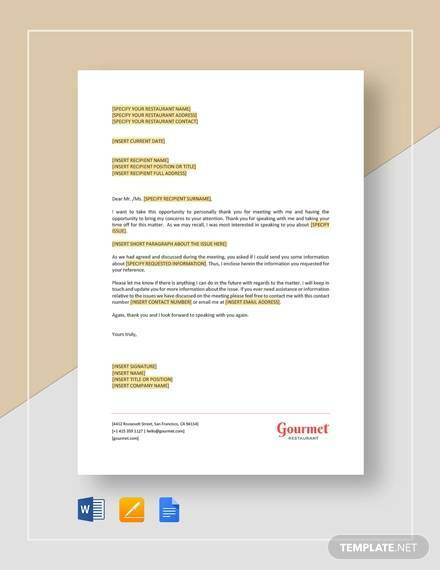 You may also take a look at Thank-You Letter Format Samples and Templates for more information on how you can format your thank-you letters. 1. Do not forget to say thank-you. You need to be specific with the reason why you are saying thank you. Tell your recipient why you are thanking them. Tell them that you are thankful for the time that they have allotted, the inputs that they have given, for sharing useful and relevant information during the meeting. In short: Be appreciative. 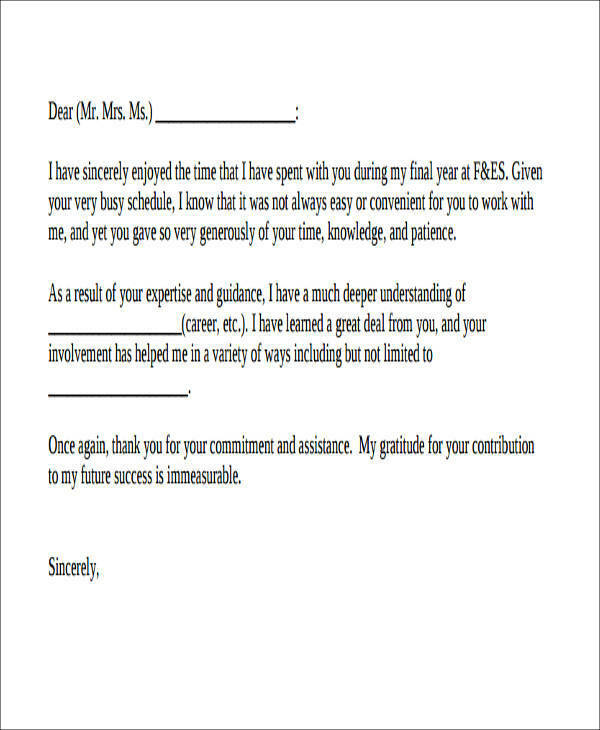 You may also see sample thank you letter templates to boss. 2. Include a common ground. List down what you have learned during the meeting. Highlight all of the positive aspects of the meeting. Make sure that it is appropriate and that you keep everything professional and formal. You may also like sample professional thank you letters. What was the primary agenda of the meeting? What did you talk about that is relevant to the meeting? What did you learn from the meeting? 4. Follow up on your actions. Once the meeting has ended, it does not end there. If you promised to look something up, you should make sure that you do look it up and that you include what you found out in the letter. Always make sure that you do what is expected of you. You may also check out sample interview thank you letters. 5. Request what is needed. If there is a need for you to attach documents or have an enclosure in the letter, make sure that you request for these as soon as possible so that there will be no delays. 6. Include the next meeting date. 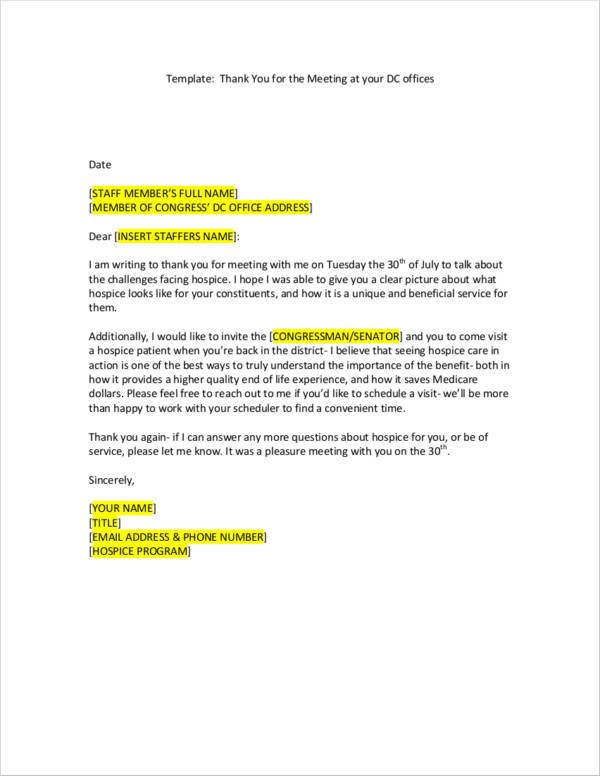 To make sure that everyone is informed about the next contact date, you want to make sure that it is also included in the letter. Suggest having the date penciled in their calendars to ensure that no one forgets about it and that everyone can make the proper adjustments. 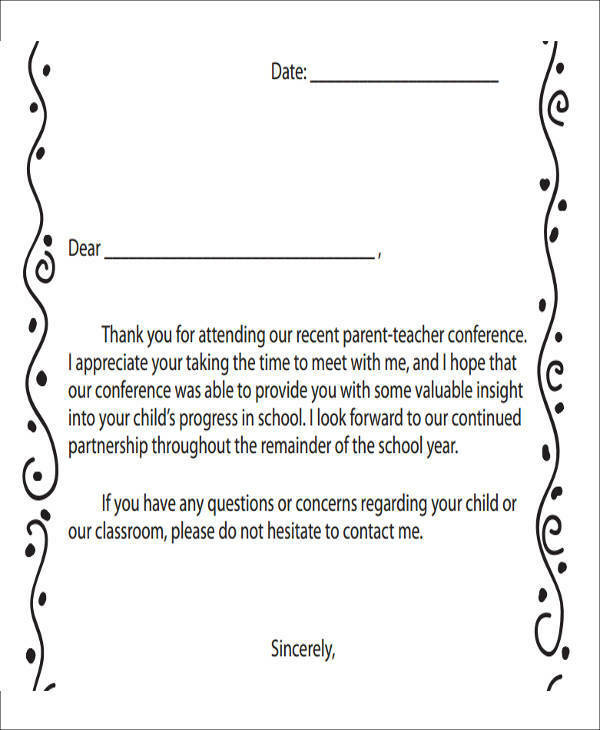 You might be interested in sample thank you letters for appreciation. 7. Make use of professional closing. Keep everything professional until the end of the letter. Do not forget to sign the letter. Now it’s time for you to start sending the letters to their corresponding recipients. Writing an email thank-you letter? 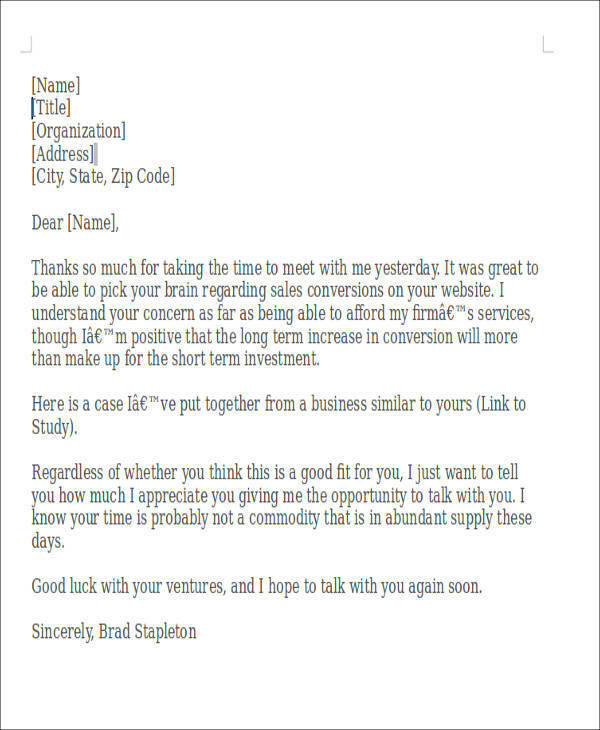 Check out Thank-You Email Samples for great examples of email thank-you letters. There are a couple of things that you want to make sure that you do not do when it comes to your meeting thank-you letters. Check out the list that we have below. 1. Sending the meeting thank-you letter to the wrong person. You want to make sure that you always know who you are sending the formal letter to. If you send the letter to the wrong person, you just definitely wasted time and effort, plus the correct recipient has missed the opportunity to actually receive your letter. What’s worse? You just probably revealed sensitive information to the wrong person, which is probably the biggest mistake you could ever make. 2. Making the thank-you letter too long. enclose what need to be enclosed. You want to make sure that your letter is free from any grammatical errors as well as misspellings. Not doing so just gives the impression that you are not professional and that you are careless. You certainly do not want that impression as it can make it seem like you cannot be trusted. You may also see sample personal thank-you letters. 4. Not including your contact information. This one should be common sense. How do you expect the recipient to get in touch with you should they have any clarifications or questions, right? Unless you are sending an email thank-you letter, the recipient will have a hard time getting in touch with you. 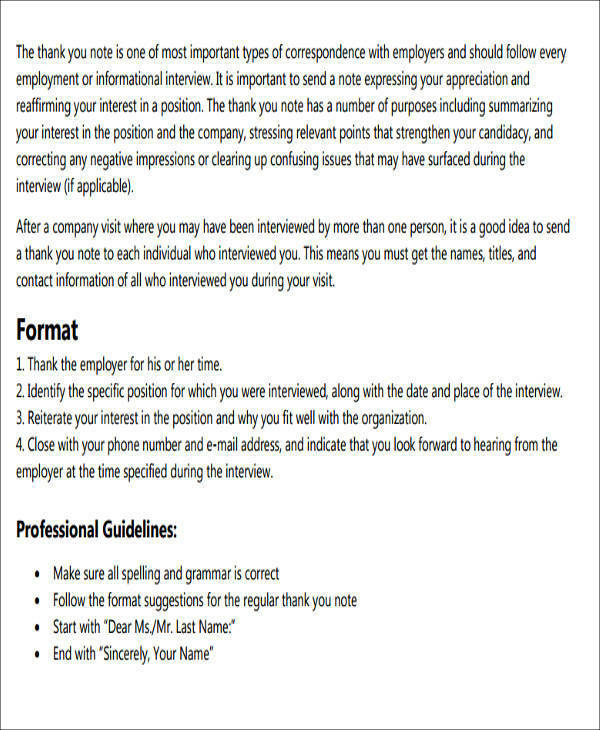 You may also like sample thank you letters for job offer. 5. Waiting too long to send the letter. Your letter should be sent within the 24–48 hour window after the meeting was conducted. Waiting too long can risk you losing a client (if it was a client meeting) to your competitor, which will definitely be a loss for you. Keep your relationship safe by sending your thanks immediately. Plus, you are sure that the information they received from the meeting is still fresh in their mind. You may also check out thank you letters after interview. 6. Writing the letter in a generic manner. Sure, it will take up a lot of time to actually write one letter for each of the members of the meeting. 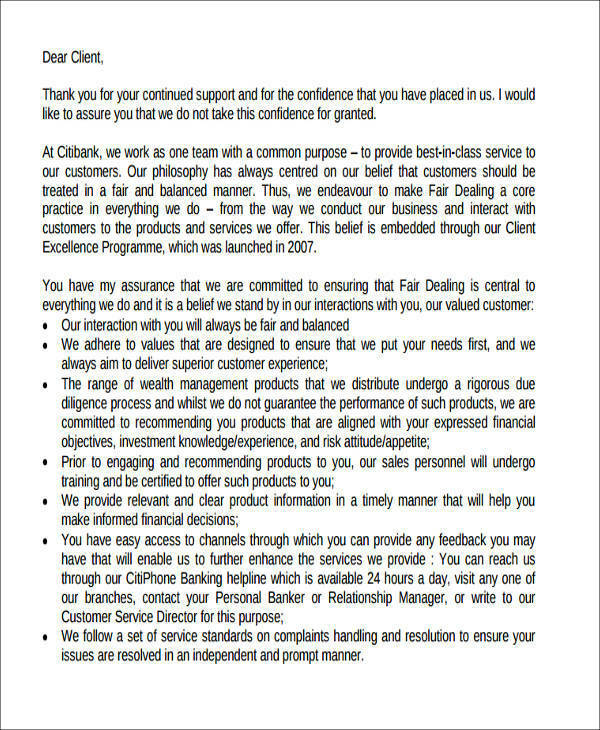 However, using a thank-you letter template is indeed more convenient. Make sure that you make use of words that will not seem like you copy-pasted from a template. Modify it to fit the meeting setting that you had with the members of the meeting. You can check out more about thank-you letter guidelines at Guidelines for Thank-You Letters. It is important in the business world to always be ahead of your competitors. There are many ways on how you can be ahead of your competitors. You can come up with new products, make awesome advertisements, provide great customer service, or be able to come up with prices that are competitive. You want to make sure that your business is always going to stand out from the rest of your competitors. The best way to stand out is being able to make your communication with customers and clients impeccable. 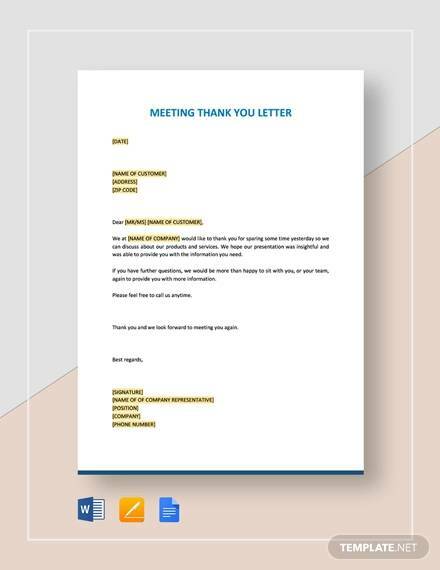 Meeting thank-you letters are important and they are going to be great means of communicating with clients, suppliers, and even customers. 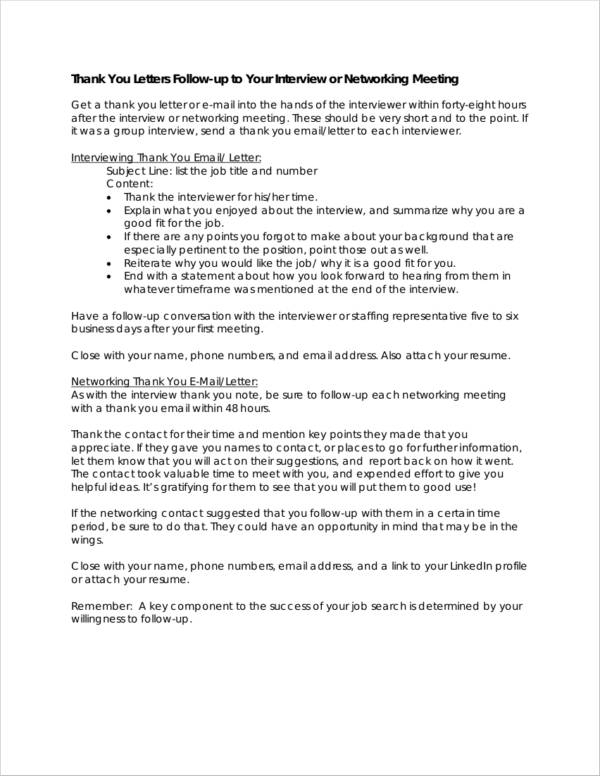 You may also see sample thank-you letter to recruiter. 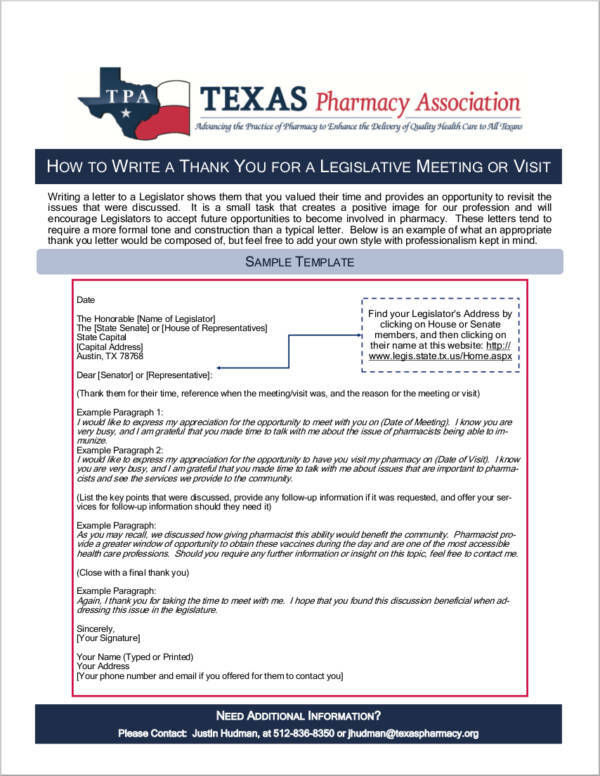 Meeting thank-you letters can set you apart and they can also make your recipients feel like their presence during the meeting has been well-appreciated and it will definitely make them come back for more. You may also like thank you letters to professor.